I think I’ve finally made an important mental leap, as far as business and startups are concerned. It’s not just the idea I need, it’s the execution of the idea. So far, with the exception of Alagad, my execution on my various ideas has been less than stellar. 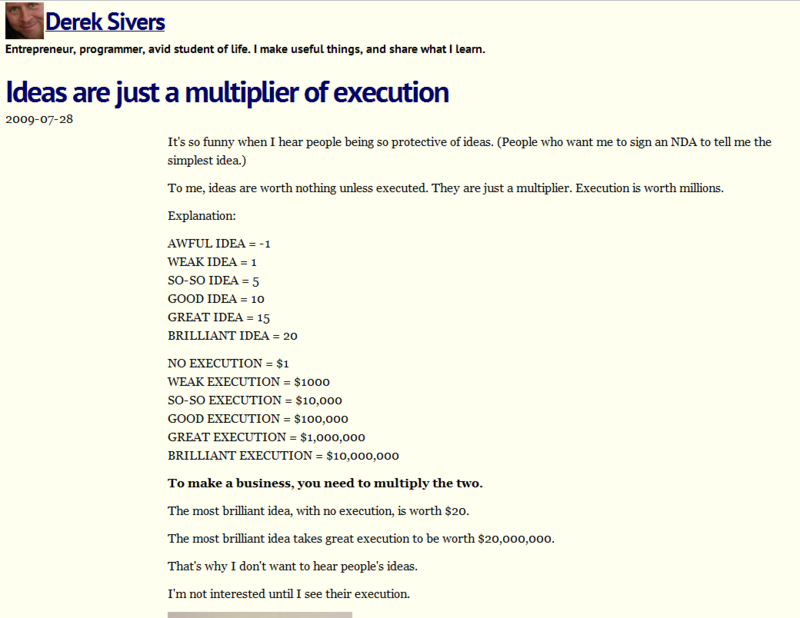 This screencap was taken from Derek Sivers blog. Why the poster posted an image and not a link to the blog, I don’t know. I’ve ranted in the past about how many brilliant ideas I have. And, in all seriousness, I do think some of them are pretty good. But it would seem that my execution has been pretty weak. Truth be told, I already knew this, but this image really crystalized the idea for me. In fact, I don’t even technically run my own company, Alagad, any more. Randy Miller, my father in law, took over as CEO about a year ago. I still drive the company’s concepts and technical direction. But, when it comes down to making sure we get stuff done that we need to, I’ve handed that off to Randy. For Randy, this must be like herding cats. To a degree, I think the fact that Alagad grew to what it was at its’ peak (13 people and 7 figures of income) was almost luck and perseverance more than a good execution. I had the passion for what we were doing, but I pretty much was clueless on how to generate leads and make sales. To a degree, I think that’s because Alagad has always tried to be everything to everyone. I’d say “If it can be done on the internet, we can do it.” True though this may be, it’s not the easiest thing to sell. I was talking with my psychiatrist the other day about ADHD, which I’ve recently learned I have. I was lamenting how many half finished projects I have. I’ll be working on one of my ideas diligently, and then suddenly come up with some brilliant new idea that I’m totally incapable of ignoring. It’s so easy for me to get knocked off track and feel like my latest idea cannot be ignored! It’ll be quicker, easier, bigger, and when it’s done, it will finance all these other ideas I want to do! This is actually why I started ProjectSpark! last week. I’m really hoping to find some people who can help me overcome some of my weaknesses, such as execution. Because, frankly, I don’t want to flop around like a fish out of water forever. For those who don’t know, ADHD is essentially an impairment of working memory. What that means is I don’t have as much storage as other people do in the part of my brain where I work with information. So, when I come up with an exciting new idea I essentially can’t remember why my previous ideas shouldn’t be immediately usurped. I’m always seeing the world from a new perspective. This might also explain why I can’t remember names to save my frickin’ life. To help overcome this, my psychiatrist assigned some homework to me. She wants me to create a flow chart of my decision making process. Basically, I need to draw up how I decide what I should be doing at any given time, and where that will lead me. The idea being that I can constantly refer back to this flowchart to go through a decision making process that doesn’t change every time I make a choice. This should help me prioritize my work and keep my eye on the prize. Frankly, I have no idea how the hell to do this. I’m going to draw something up and probably share it here. And then later I’ll revise it with her assistance. I see the value in this, but I’ve got no idea how to do it. So, now I know I need to improve my execution. (Not that kind, sorry to disappoint.) Figuring out how is the next big challenge. Any ideas?